Wreck-It Ralph: I'm bad, and that's good. I will never be good, and that's not bad. There's no one I'd rather be than me. Wreck-It Ralph: Because if that little kid likes me, how bad can I be? Wreck-It Ralph: I hate you. Vanellope von Schweetz: Hey, why are your hands so freakishly big? Wreck-It Ralph: Uh, I don't know. Why are you so freakishly annoying? Fix-It Felix: [goggles at Calhoun] Look at that high definition. Your face... it's AMAZING! Wreck-It Ralph: My name's Ralph, and I'm a bad guy. Uh, let's see... I'm nine feet tall, I weigh six hundred and forty three pounds, got a bit of a temper on me. My passion level's very near the surface, I guess, not gonna lie. Anywho, what else, uh... I'm a wrecker. I wreck things, professionally. I mean, I'm very good at what I do. Probably the best I know. Thing is, fixing's the name of the game. Literally. Fix-It Felix Jr. So yeah, naturally, the guy with the name Fix-It Felix is the good guy. He's nice enough as good guys go. Definitely fixes stuff really well. But, uh, if you got a magic hammer from your father, how hard can it be? If he was a regular contractor, carpenter guy, I guarantee you, you will not be able to fix the damage that I do as quickly. When Felix does a good job, he gets a medal. But, are there medals for wrecking stuff really well? To that, I say, ha! And no, there aren't. For thirty years I have been doing this, and I have seen a lot of other games come and go, how sad. Think about those guys at Asteroids? Boom, gone. Centipede? Who knows where that guy is, you know? Look, a steady arcade gig is nothing to sneeze at, I'm very lucky. It's just, I gotta say, it becomes kinda hard to love your job... when no one else seems to like you for doing it. Wreck-It Ralph: We gotta try! Wreck-It Ralph: I'm a wrecker, not a baker. Sergeant Calhoun: It's "make your mommas proud" time! Vanellope von Schweetz: You could stay. You could have your own castle, where you can wreck and stink as much as you want, and no one would ever treat you badly ever again. Wreck-It Ralph: Thanks. But I have a job to do. It may not be as fancy as being president but it's my duty, and it's a BIG duty! Surge Protector: Step aside, sir. Random security check. Wreck-It Ralph: Random my behind! You always stop me. Surge Protector: I'm just a surge protector doing my job, sir. Name? Surge Protector: And where are you coming from? Surge Protector: Did you bring any fruit with you? Wreck-It Ralph: [Hides the cherries he took from Pac-Man] No. No. No fruit. Surge Protector: OK, then. Where you heading? Wreck-It Ralph: Uh...Fix-It Felix Jr.
Surge Protector: I get that a lot. Proceed. Vanellope von Schweetz: What? Speak up, I can't hear you. Your breath is so bad it made my ears numb! Sonic the Hedgehog: If you leave your game, stay safe, stay alert! Because if you die outside of your own game, you don't regenerate. Ever! Game over. Wreck-It Ralph: [Referring to his medal] I didn't win it in my game, I won it in Hero's Duty. Vanellope von Schweetz: 'Hero's Doodie'? Pffffft! Wreck-It Ralph: It's not that kind of duty! Vanellope von Schweetz: [Still laughing] I bet you really gotta watch where you step in a game called 'Hero's Doodie'! What did ya get the medal for? Wiping? I hope you washed your hands after you handled that medal! Wreck-It Ralph: I don't have time for this. Vanellope von Schweetz: One more, one more. Why did the the hero flush the toilet?... Say why. Vanellope von Schweetz: Because it was his... doodie! Wreck-It Ralph: How dare you insult Hero's Duty, you little guttersnipe! I earned that medal! And you better get it back for me toot-sweet sister! Vanellope von Schweetz: Well unless you've got a kart hidden in the fat folds of your neck, I can't help you. Wreck-It Ralph: I know, I know, I know. I'm an idiot. Wreck-It Ralph: A real numb-skull? Wreck-It Ralph: A selfish diaper-baby. Vanellope von Schweetz: The stinkiest brain ever. Wreck-It Ralph: You're a winner! Wreck-It Ralph: And you're adorable! Vanellope von Schweetz: I'm ADORABLE! Sergeant Calhoun: This is it, ladies! The kitten whispers and tickle fights end now! Sergeant Calhoun: Flattery don't charge these batteries, civilian. Vanellope von Schweetz: You really are a bad guy. Vanellope von Schweetz: [after a trial run] So how'd I do? Vanellope von Schweetz: Right, right. That's a good note. Wreck-It Ralph: I'm not leaving you here alone! Wreck-It Ralph: Hey, Cough Drop! Explain somethin' to me; If Vanellope was never meant to exist, then why is her picture on the side of the game console? Wreck-It Ralph: What's goin' on in this candy-coated heart of darkness? Wreck-It Ralph: I'll lick you! Sour Bill: Ugh! It's like sandpaper! Wreck-It Ralph: Mmm, I wonder how many licks it'll take to get to your center? Sour Bill: I'll take it to my grave! Wreck-It Ralph: Fair enough. [tosses Sour Bill into his mouth] Oh, they call you Sour Bill for a reason! [Sour Bill lets out a muffled scream and Ralph takes him out] Had enough yet? Sour Bill: Okay, okay, I'll talk, I'll talk! Vanellope was a racer until King Candy tried to delete her code! Wreck-It Ralph: Tried to delete her code? So that's why she's a glitch! Why is he doing this to her?! Sour Bill: I don't know! Sour Bill: No, no, no, no, no, no! I swear I don't know! He literally locked up our memories and I cannot remember! Nobody can! But I do know this. He'll do anything to keep her from racing. Because if she crosses the finish line, the game will reset and she won't be a glitch anymore! Wreck-It Ralph: Where is she now? Sour Bill: In the fungeon with Fix-It Felix. Sour Bill: I'm sorry! That's all I know, that's all I know, I swear! Now please, don't put me back in your filthy mouth again! Sour Bill: Yes, okay, I will, I will. Thank you. Clyde: Question, Ralph. We've been asking you to Bad-Anon for years now, and tonight you finally show up. Why is that? Wreck-It Ralph: I dunno, I just felt like coming. I mean, I suppose it has something to do with the fact that uh... well, today's the 30th anniversary of my game. Satan: Uh, it's "Sah-teen", actually. Wreck-It Ralph: Got it. But here's the thing. [pause] I don't wanna be the bad guy anymore. Kano: You can't mess with the program, Ralph! Bison: You're not goin' Turbo, are you? Wreck-It Ralph: Turbo?! No, I'm not going Turbo! C'mon, guys! Is it "Turbo" to want a friend? Or a medal? Or a piece of pie every once in a while? Is it "Turbo" to want more out of life? Clyde: Ralph, Ralph, we get it. But we can't change who we are. The sooner you accept that, the better off your game and your life will be. Zangief: Hey. One game at a time, Ralph. Fix-It Felix: It's my job to fix whatever Ralph wrecks! Turbo: Because of you, Ralph, I'm now the most powerful virus in the arcade! I should thank you. But... it'd be more fun to kill you! Wreck-It Ralph: First, you have to fix this kart for me. Fix-It Felix: I don't have to do boo! Forgive my potty-mouth. King Candy: Get off of my track! Vanellope von Schweetz: Hey! What are you, crazy?! Vanellope von Schweetz: Knock it off! King Candy: Let me go -- I'm not letting you undo all my hard work! Vanellope von Schweetz: What the -- Who are you?! Turbo: I'm Turbo, the greatest racer ever! And I did not reprogram this world to let you and that halitosis-riddled warthog take it away from me! Sour Bill: All hail the rightful ruler of Sugar Rush... Princess Vanellope. Taffyta: I remember! She's our princess! Taffyta: We are so sorry about the way we treated you! Rancis: Yeah, those were, uh, jokes! Candlehead: [sobs] I was just doing what Taffyta told me to do! Vanellope von Schweetz: Tut tut! As your merciful princess, I hereby decree that everyone who was ever mean to me shall be... [other racers look on with anticipation] ...Executed. Taffyta: No, no, no, please! Please! Fix-It Felix: Oh my land! Calhoun: Well, this place just got interesting. Taffyta: No! I don't wanna die! Vanellopevon Schweetz: Ah, I'm just kiddin'! Vanellope von Schweetz: Stop crying, Taffyta. Taffyta: [hyperventilates] I'm trying! It won't stop! King Candy: It's game over for both of you! Wreck-It Ralph: No... Just for me! Sergeant Calhoun: Your face is still red, you might want to hit it with your hammer again. Fix-It Felix: Oh, that ain't blunt force trauma, ma'am. It's just the honeyglow in my cheeks. You know, you are one dynamite gal. Calhoun's Fiancee: [At the artillery range] You know, you are one dynamite gal. Calhoun's Fiancee: You are one dynamite gal. Fix-It Felix: But... all I said is that you're a dynamite gal. Sergeant Calhoun: I said get out! Wreck-It Ralph: What's going on in this candy-coated heart of darkness? Sour Bill: [deep voice] no! King Candy: Stop in the name of the king! Wreck-It Ralph: Turbo? So that's really you! Vanellope von Schweetz: [trapped in Sugar Rush] Just go, Ralph. It's okay. Wreck-It Ralph: Sometimes I think, man, it sure must be nice being the good guy. Clyde: Nice share, Ralph. We've all felt what you're feeling and we've come to terms with it. Zangief: Right here. I'm Zangief, I'm bad guy. Zangief: I relate to you, Ralph. When I hit bottom, I was crushing man's skull like sparrow's egg, between by thighs... and I think, why you have to be so bad, Zangief? Why can't you be more like good guy? Then I have moment of clarity... if Zangief is good guy, who will crush man's skull like sparrow's eggs between thighs? And I say, Zangief you are bad guy, but this does not mean you are bad guy. 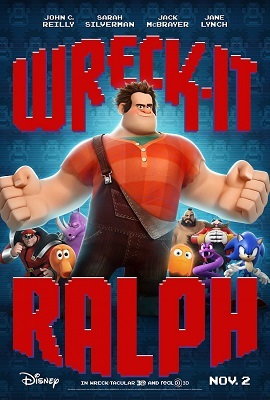 Wreck-It Ralph: Right... I'm sorry, you lost me there. Wreck-It Ralph, Bad-Anon Members: Hi Zombie. Zombie: Zangief saying labels not make you happy. Good, bad, nggghhhh... you must love you. Fix-It Felix: Back when the arcade first opened, Turbo Time was by far the most popular game, and Turbo, he loved the attention. So when Road Blasters got plugged in and stole Turbo's thunder, boy was he jealous, so jealous, that he abandoned his game and tried to take over the new one. Turbo ended up putting both games and himself out of order, for good. King Candy: Sour Bill, de-taffy-fy this monster so we can see what we're up against here! King Candy: Milk my Duds! It's Wreck-It Ralph! Wreck-It Ralph: Yeah. Who are you, the guy that makes the donuts? King Candy: Hoo-hoo, please! No, I'm King Candy! Wreck-It Ralph: I see you're a fan of pink. King Candy: Salmon! Salmon, that's obviously salm-- What are you doing here? Wreck-It Ralph: Look, Your Candiness, this is just a big misunderstanding. Just get me out of this cupcake, I'll get my medal, and I'll be out of your way. King Candy: Your medal? Hoo-hoo-hoo! Bad guys don't win medals! Wreck-It Ralph: Well, this one did. I earned it over in Hero's Duty. King Candy: [suddenly serious] You game-jumped? Ralph... you're not going Turbo, are you? King Candy: Because if you think you can come in here, heh, to my kingdom, and take over my game, you've got another think coming! Wreck-It Ralph: EASY, Your Puffiness! It's not my fault one of your Children of the Candy Corn stole my medal. King Candy: "Children of the candy corn"? Who -- [gasps] The glitch! The coin she used to buy her way into the race, that was your medal? Wreck-It Ralph: She did what?! I need that back! King Candy: Well, I'm afraid I can't help you, it's gone, you know. It's, it's nothing but code now! And it'll stay that way until someone wins the cup at the end of the race! Wreck-It Ralph: Well, maybe I'll just have to have a little talk with the winner, then. Wreck-It Ralph: Listen, Nellie Wafer, I'm not leavin' without my medal! King Candy: Yes, you are! Wynnchel, Duncan, get him out of that cupcake and on the first train back home. And if I ever see you here again, Wreck-It Ralph... hoo-hoo, I'll lock you in my Fungeon! King Candy: Fun dungeon. Y'know, it's a play on words? Hoo-hoo...it's a fun... Never mind! Now, I've got a glitch to deal with, thanks to you. Goodbye, Wreck-It Ralph! It hasn't been a pleasure! Moppet Girl: [unable to play "Wreck-It Ralph"] Where's the Wrecking guy? Sergeant Calhoun: Who in the holy hot cakes are you? Wreck-It Ralph, Vanellope von Schweetz: Top shelf! Sergeant Calhoun: Doomsday and Armageddon just had a baby and it... is... ugly! Sergeant Calhoun: Do you know what the first rule of Hero's Duty is, soldier? Wreck-It Ralph: No cuts, no butts, no coconuts? Sergeant Calhoun: "Fear" is a four-letter word, ladies! You wanna go pee pee in your big-boy slacks, keep it to yourself! Wreck-It Ralph: [in the middle of "Hero's Duty"] When did video games become so violent and scary? Wreck-It Ralph: They invited Pac-Man? That cherry-chasing dot-muncher isn't even part of the game! Fix-It Felix: I'm gonna wreck it! Fix-It Felix: Why do I fix everything I touch? Sergeant Calhoun: The selfish man is like a mangy dog chasing a cautionary tail. Wreck-It Ralph: Felix? Mary? Anyone? Gene: Well, look who showed up. Wreck-It Ralph: Gene, where is everybody? Gene: They all left. After Felix went to looking for you and didn't come back, everyone panicked and abandoned ship. Gene: Then what did you want? Wreck-It Ralph: I don't know! I was just sick of living alone in the garbage! King Candy: If Vanellope races, Ralph, she'll be in the game roster. When that happens, anyone who plays her in the game will see she's a glitch. We'll be put out of order for good. All of my citizens will be homeless... but there will be one who cannot escape because she's a glitch. I know it's tough, but heroes have to make the tough choices sometimes. Wreck-It Ralph: The big deal? Well, this may come as a shock to you, but in my game, I'm the bad guy, and I live in the garbage. Wreck-It Ralph: No, not cool! Unhygienic, and lonely, and boring... and that crummy medal, was going to change all that. I bring that baby home I'll get fireworks, ice sculptures, pies! It's grown up stuff, a kid wouldn't understand. Vanellope von Schweetz: No, I get it! That's exactly what racing would do for me! Wreck-It Ralph: Well guess what? Wreck-It Ralph: News flash for you... neither one of us is getting what we want! Vanellope von Schweetz: What's your name? Wreck-It Ralph: Ralph, Wreck-It Ralph. Fix-It Felix: Ralph abandoned his game! Vanellope von Schweetz: I bet you really gotta watch where you step in a game called "Hero's Doodie"! Fix-It Felix: You are one dynamite gal. Sergeant Calhoun: [stops her ship] Get out! Fix-It Felix: Calm down, everybody! Ralph probably fell asleep in the washing-room of Tapper's again. Wreck-It Ralph: Oh, come on Zangief... Gross! Fix-It Felix: Do you have any idea what you put me through? I've been pushed around, abused, slapped... I almost drowned in chocolate milk mix! And then I met the most dynamite gal... ah, she gave me the honey glow something awful! But, she rebuffed my affections... and then I got thrown in jail! Wreck-It Ralph: Felix, get a hold of yourself! Fix-It Felix: No, ralph! You don't know what it's like to be rejected and treated like a criminal. Wreck-It Ralph: Yes I do... That's every day of my life. Wreck-It Ralph: Which is why I tried to run away, be a good guy, but I'm not! I'm just a bad guy, and I need your help... There's a little girl who's only hope is this cart. Please, Felix, fix it. And I promise, I will never try to be good again. Wreck-It Ralph: [takes Calhoun's hoverboard] Mind if I borrow this? I've got some wrecking to do! Wreck-It Ralph: [gives a cherry to the homeless Qbert and Co] Here you go, guys. It's fresh from Pac-Man. King Candy: You hit a guy, with glasses. That's... that's... Well played.